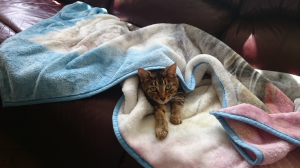 An indoor lifestyle keeps our cats healthier, safer and living longer lives. However boredom, frustration and environmental stress are some of the most common reasons why indoor cats develop behavior problems. 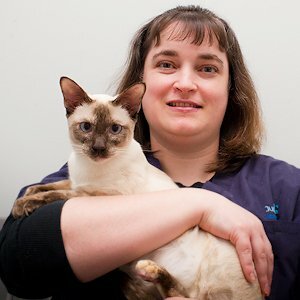 Listed below are suggestions for keeping your indoor cat active, stimulated and happy. 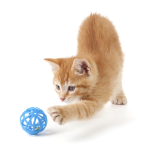 Cats are very prey driven, so trying different varieties of toys is important to find out what your cat likes to “hunt”. Be patient! Don’t give up! It is worth it. If left to their own devices, cats would generally eat small meals 9 – 16 times a day. Mulitple feeding areas around the house would be ideal but not very practical. Instead, the best way to do this is by having several foraging toys or puzzle feeders. 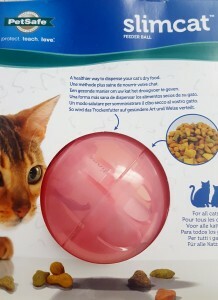 To start your cat off using this feeding method you want to use easy, clear puzzles with many openings so that your cat can see, hear the food and the food easily falls out or is dispensed. The puzzles should be ½ to ¾ full for easy dispensing. 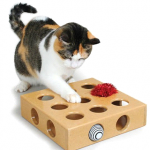 As your cat gets used to this way of eating, increase the difficulty of the puzzle, by having smaller holes, and/or adding toys to them so it is harder for them to get the food out. Feeding your cat this way will increase the cat’s exercise level and keep him/her stimulated by having them work for their food. Playing with your cat every day is very important for the human/ cat relationship. The key is finding what your cat likes to play with. Having a variety of toys at hand is best. 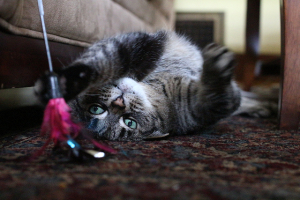 If you find your cat gets bored with the toys it has, switch them out for some new ones and keep rotating the toys. For the toys that are not in use do a “Catnip Marinade” until you are ready to use them. Place all toys in container sprinkle with fresh catnip and close lid until ready for use. This helps save money, so you don’t have to buy new toys all the time. 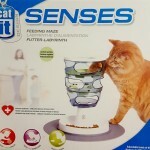 Play “Go Fish” – place a small amount of water with some marbles at the bottom and watch your cat go fishing for them. Play games that mimic prey, once they catch the prey make sure you reward them with a treat, so they don’t get frustrated that they didn’t catch anything. This works well with the laser toys. 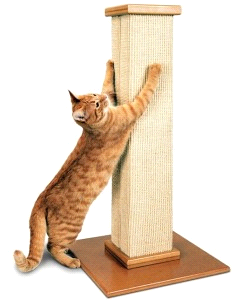 Did you know that 80% of cats prefer the sisal rope scratching posts while cats over the age of 10 prefer the carpeted ones? Scratching post should be over 3’ tall so your cat can achieve full body stretch. The post should be sturdy and stable. Avoid the door hanging post. To blow off stress and frustration. Place the scratching post in high traffic area in your home. A cat prefers to be up high which allows them to look around at an area and provides a sense of safety.